Barb Dowski admits her garden—which is best described by the word “lovely”—has become an obsession. 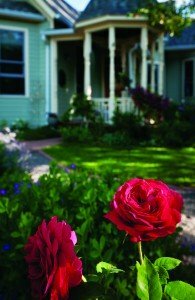 The 19th-century late-Victorian home in downtown Lafayette is surrounded by a decadent arrangement of roses, peonies, columbines, hostas and other lilies, berries, a raised veggie garden out back and countless shrubs and perennials. At least, that’s what it looks like this week. As a Master Gardener, Dowski does not consider her garden a stagnant thing. It’s constantly evolving with her own tastes and preferences. Ask Dowski about her garden, and she’ll speak a language unrecognizable to non-gardener’s ear. Spending one to two hours a day in the garden during the spring and summer, hers is an obsession that far surpasses that of casual gardeners. She finds inspiration whenever she steps into a garden store, every time she goes on a garden tour, whenever she opens a magazine. “It’s about going into a garden center, seeing a plant you like and saying, ‘I want that,’” she said. The Dowskis have lived in their Lafayette home for 15 years. When they moved in, they ripped out junipers and planted a cherry tree, two apple trees and a pear tree. They also added a four-square vegetable garden. Still, it was almost all grass. About six years ago, the couple gave the house a new addition and overhauled their whole yard, adding a sunken garden, rock walkway, a bee hive and a bevy of new shrubs, edibles and flowers, including nearly 40 roses. She says it took about three years to get the garden settled. But really, it’s never done.